During the winter of 2013, I had the pleasure of visiting the Detroit North American Auto Show to take sight of the new Corvette Stingray. But while there, I had the ability to see first hand that car makers were trying desperately to up fuel mileage and bring emissions down. As you walked the isles from one car to the other, almost every model and its EPA sticker made you believe it was doing the best thing to save the world. I will not forget the experience of test driving the Nissan Leaf and a Toyota Prius. While both cars made you feel you were in an over-sized golf cart, the Prius just signaled it bit late, however that transition between IC engine to battery was so flawless you'd have to listen in hard to make out any signs of a hybrid beneath the hood. Marketing is central to pushing these cars out to market. And perhaps no one is doing it better in the auto market than Tesla. After all, Elon Musk has achieved enough orders that you have to sit 3 months in a waiting list to purchase a $73,000 vehicle! A classy, exclusive panacea to the vehicular emissions issue! 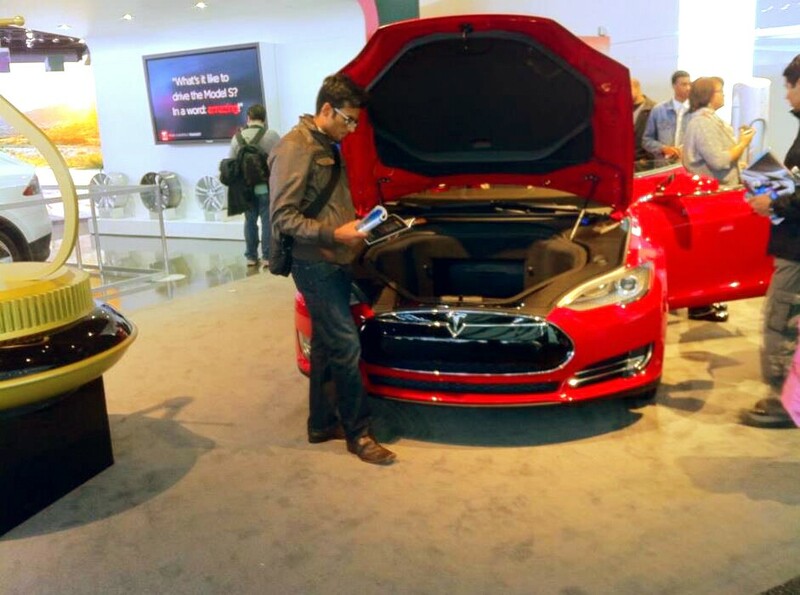 I remember visiting the decorated Model S booth and looking with much interest at this vehicle. Sitting there in an obscure corner of the exhibition hall far away from the GMCs, Dodges and Chevys, it was bright red, its hood wide open showing a luggage compartment. The interior dashboard looking like something out of a sci-fi movie, showing point to point statistics about everything on the car on a generous 17" touchscreen display. And no sir, no petrol here. Just a charging port in the side. You connected it to a wall. What I was looking at that day was an idea. I was told with this idea, you could travel 300 miles on 85KWh Li-Ion battery that was neatly tucked under the floor board. So in effect, all it took to transport yourself from A-B was 283 Wh/mile. Until I took the fun out of everything and asked the Tesla "model specialist" 'c'mon what are the actual figures? ', battery reliability, cold weather issues warranty, insurance and so on. Interestingly, actual studies have shown the Tesla marketing figures to be somewhat of a myth. Apparently, if you drove this vehicle in cold weather, you'd achieve more like 225 miles on the same 85kWh battery. Now consider the charging efficiency of a lithium ion battery (85%) while pulling out from a 240V wall AC source, you'd notice that the car performance was more in the mid to upper 300's in Wh/mile driven (actual data logged figures are much higher for these charging losses if you look at the attached spreadsheet from EngineerMom). The other pesky issue not advertised is lovingly termed Vampire Load by Tesla users. If you took into account the battery drain of a 9000 type 8650 Li-Ion battery that this vehicle uses while it is is not in use you'd need the equivalent of around 600 Wh of charge from your wall to drive a mile. Most importantly, electricity for mass consumption is from a porfolio of technologies, but popularly coal and natural gas. If you are plugging in your Tesla to the wall socket, you are still getting electricity from a non-renewable source. Consider also that the CO2 emissions of producing a Li-Ion battery is a finite amount, not zero. In other words, the well to wheel emissions cost of a Tesla is not zero, infact one estimation says that some 540 g of effective CO2/mile emissions is involved in driving one. The same report put that figure higher than that of a Jeep Cherokee SUV, which emits 443g per mile, and close to that of the massive Ford Expedition, which emits 556g of CO2 per mile driven! With all the inclusive losses, you'd have to be charging your car more than what you thought you would be when you bought it. Never mind the rise in your monthly electric bill. If an entire community of say 1000 had Teslas and plugged it to their conventional electric grids, would the grid cope? What would be the jump in base loads at night? And how much more CO2 would be emitted from the invisible tailpipe if you will, while the owners slept? The main meat I wanted to capture in this post is that it is not so much that the new technology in the Tesla is bad. It is absolutely visionary. However, when you use a new system with an unsustainable infrastructure, perhaps the end result is still an unsustainable system. Hopefully, when our shift to renewables look financially competitive and technologically rewarding, the Tesla will be of far bigger appeal than it is today and without doubt, the numbers coming out significantly better. This is inherently an energy source problem. As you can see, it all comes back in a circle, knocking on the same issue : where do we get our energy from. Elon musk is a revolutionary genius.